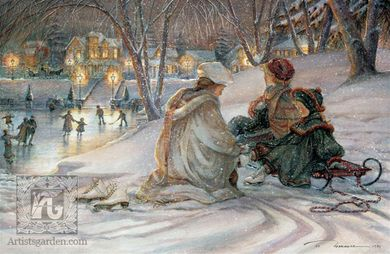 Trisha Romance Handsigned & Numbered Limited Grand Romance Collectors Edition Canvas Giclee: "Evening Skaters "
Image Size: 21" x 31 3/4"
About the Art: "As children, we walked by the light of the moon through the woods and across a crystal field to reach the pond for an evening of skating. On other nights, our father took us to the town park where lamp lights glowed through snow flakes and the ice shimmered as town folk waltzed around the rink. These images have stayed with me and were destined to become a painting one day. Little did I know that once upon a time, Simcoe Park in Niagara-onthe-Lake also had a rink where town folk waltzed to music and children found a space for sport! Moonlight and lamplight came together as I sketched the memories that enchanted me, to become "Evening Skaters".